Yes, Another happy birthday of X-rays have passed. 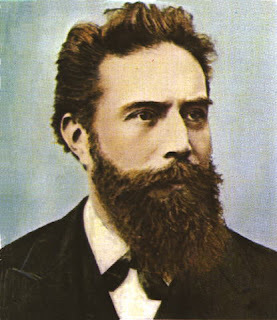 One hundred and fifteen years ago, Wilhelm Conrad Röntgen discovered that certain electromagnetic rays – X-rays – could form images on fluorescent plates.It was on 8 November 1895 that Röntgen, a professor of physics at the University of Würzburg, Bavaria discovered X-rays. 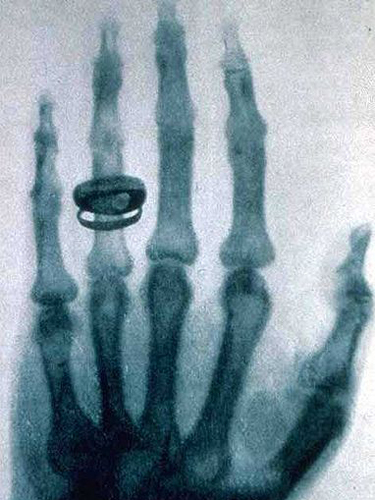 Another image of the X-ray of Rontgen's wif's hand. He found that X-rays could be used to form images of the human skeleton. 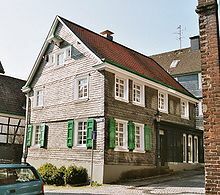 In experiments with beams of electrons inside a covered vacuum tube, Röntgen noticed that a nearby fluorescent screen glowed when the current was passed. He attributed the glowing to an unknown type of radiation passing through the tube's cover, which he called "X radiation", hence the term X-rays. A week after his discovery, Rontgen took a X-ray of his wife's hand, substituting a photographic plate for the fluorescent screen to capture the image. Her wedding ring could be seen clearly on that! This discovery turned out to be one of the most significant medical advances in history.